Because Logs, Leaves and Branches are SO HARD TO FIND??? Hey Readers! Here’s what every school needs: A 9 set of fake logs to make a fake nature trail with fake leaves to remind kids of the great wide world of plastic! 68 Responses to Because Logs, Leaves and Branches are SO HARD TO FIND??? Heck, I’m just happy they get to climb the trees at all! LOL. Back to nature, indeed. Nature will KILL YOU if you give it half a chance. How insulting. Makes me want to scream and move to the mountains where my kid can walk on real logs. We’re nearly there: the place where we enter our experiences virtually, no moulded plastic required, just electrical impulses. So safe! Our muscles will just be exercised by electrical impulses, and our brains will experience all kinds of stimulus through visual and auditory imagery alone. Am I the only one who sees where this trolley of “progress” has its last stop? Moving to the mountains won’t be far enough, and besides, I like people, I’m programmed to be in their company. I just don’t know where I can go anymore, to live an authentic human life. Your daily dose of sunshine from a maudlin pessimist. You’re welcome. Ha! You know what’s usually non-stick (unless wet)?REAL LOGS. You made me remember a present my daughter received for her 6th birthday. We returned it, and the fake marshmallow sticks too. Nothing beats an outdoor firepit with real marshmallows. Ever. Now 13 is almost an adult in my mind so this had better be a pretty serious item; a Bowie knife, a machete, a shark harpoon. Perhaps an airgun, or a power tool of some sort. It was a ball cap. The world has truly gone insane. @ Yan Seiner… you don’t mean a baseball cap do you? Like a hat with a bill, and those plastic adjustment straps in the back… please tell my you aren’t talking about that. @Havva: Yup, a baseball cap. Exactly. A fabric half-dome with a bill, and a velcro strap in the back. Don’t be so hard on this toy… just think of a literal boy in a bubble. If you must live in a hermetically sealed germ-free environment, real logs are right out, but I’m sure fake plastic logs could be sterilized to the doctors’ satisfaction! The 13+ tag gets this company out of having to test the materials to insure that they would be safe if a child decided to snack on it. They would have to prove that there isn’t lead in the dyes, no buttons can come off and choke someone that chews on it, straps are long enough to strangle a child, etc. Insane that they need to workaround like that, isn’t it? Where is Richard Louv with the outrage for this? It is amazing how the language of ‘safety’ infiltrates everything. Here is how (I think) this would have been advertized two decades ago. First change 3-7 yr olds. To Infant to 5 yr olds. How sad! My senior year Ecology class goes outside, walks in the woods, wades in the pond, and digs in the dirt EVERY DAY. It makes me sad that some kids can’t even experience little awesome things like this. Makes me feel grateful to go to a school that isn’t afraid of nature. Mercury, however, is a different story. To be fair, there are lots of schools in urban and suburban areas which don’t have naturally-occurring logs outside. @ K… lord help us if any kid over 8 is still snacking on their clothing. That just reminds me of this insane and detailed notice from one of my husband’s favorite game designers. Loony labs sells these plastic pyramids that stack and nest and are used for a wide variety of strategy games. My niece and nephew (5 & 8 yrs old) love these and competently play several games with them, and frequently ask to learn more. The top comes to a point, but is a bit rounded and blunt enough that it would take a lot of force to puncture skin. Very safe, we let our toddler stack the largest ones while we play. But the company is not allowed to sell them in the EU now because their safety agency suddenly started applying a section of code (apparently intended for bicycles) they hadn’t previously. The US has similar code, even though the pyramids got approved for 6+ in the US. But now the company is scared so they are all labeled 14+ even here. They are unusually open about the process in the above link. Back when my husband purchased his pyramids there was nothing but a little safety warning on the bottom that said “Caution: Don’t use these as a stabbing implement, or in other irresponsible ways.” And possibly a no kids under 3 logo. Tons of fans play these with their children. Some of the games for them were WRITTEN by children. Kids and these game parts are a natural. Reminds me of the video of some years back. Let your children experience the wonder of playing in snow – by watching a video of other children playing in snow! I love how there is a small child on there and he can barely fit both feet on the thing. These look like toys for an infant, and they are being marketed to SCHOOL aged children?! How appropriate. Not 5 minutes ago, my son & I just returned–from walking about 3/10ths of a mile in the WOODS. Mud puddles, sticks, logs, bugs, leaves, twigs–all right in our property. These people would stand no chance of getting any of my money even if this weren’t the case, and given that it IS the case–they REALLY stand no chance. The problem is in the use of the product and not in the product itself. If used because the outdoors and real logs and stumps are too dangerous, it is problematic. If used for those times when going outside isn’t possible or in areas where downed logs and stumps are not readily available, it is cute and fun. I see nothing in the advertising that indicates that they mean for kids to never step foot outside. Most people live in places where weather prohibits outside play at least some of the 365 days a year but kids still have energy to burn. Daylight ends by 5 in the winter but kids still want to play. Adults have to cook, clean, talk, pay bills, etc. and this is a fun and active alternative to tv to keep the little ones occupied. Daycares and preschools may not be able to install fallen logs and stumps for kids climbing pleasure. However, the ages are way off. This looks fund for toddlers and maybe preschoolers. I can’t imagine my 1st grader still enjoying it. Donna is right on. The ages are way off. They are trying to take advantage of fears, hectic lifestyles and such to market these to kids older than they were first designed for. Perfectly fine toy, as long as parents do not use it to replace the outdoors. I could see a kid using it to replicate and area they play in at the trailer or cottage, in their room, kinda thing. That thumping you hear is me banging my head against the desk. This product looks the way nature might if one had just consumed a whole raft of illegal substances…..
@Warren and Donna, you both have a point regarding infants, but personally I just let mine climb on the furniture! (Great if you have dungery old couches…). @Yan, where can I buy one of these highly dangerous baseball caps? The midget just turned 13, so can finally wear one. And how do I stop my 11 year old possibly chewing on it? Sure, there are other things to climb on inside. Doesn’t make people who would rather buy something for that specific purpose wrong. I think people are bothered by the “outdoor” design. Change this toy to red and blue polka dots and it becomes just another thing for little kids to play on while stuck indoors. Not necessary, but no more offensive than the thousands of other toys available to those who wish to buy them. Make it look like stumps and trees and it becomes offensive and encouraging kids to stay indoors. I think people here are just way over-thinking the product. About kids chewing on clothes. My older son is about to turn 11 and I’m constantly telling him to quit chewing on his shirt sleeves and collars. That boy still puts everything in his mouth. I have no idea why but I’ve also caught myself chewing on my collar for no real reason. I guess we’re weird. Of course my son also has a ton of baseball caps. He doesn’t chew on those since they’re, you know, on his head. As for the “logs”. I can see them being useful at a daycare in the city where they don’t have a lot of grassy space and definitely don’t have room for real logs. My 2yo saw the picture and he liked it. I think he’d have fun in the house. We don’t have logs and stuff in our yard but there’s a park in Vancouver that chopped down a tree and then cut it up and planted the pieces in the sand to make an obstacle course for the kids. Jack was like 19 months and walking through it. They had some of the pieces just a couple inches off the ground. Some were up to a foot high and they weren’t perfectly even (they were pretty wide, the tree must have been huge). Then some pieces were laid on their side, cut in half to make a flat place to walk, some had the rounded side up. There were a lot of kids playing over there instead of on the huge metal and plastic playset. We were at Costco today and my husband showed me a big bag of blocks. Foam blocks because the real wood kind must be too dangerous. *eye roll* I will not buy foam blocks, they can’t stack all that good. When my 6yo was 2 she got a bag of wooden blocks (plain and some painted in the traditional shapes–round, long and flat, squares, triangles and arches). She adored those things and by 2 1/2 was building these elaborate castles and towers almost as tall as she was. Everyone I showed was shocked to find out they were built by a toddler. She would have hated foam ones. I wonder if my grandparents thought it was weird that I had a toy hobby horse instead of riding a real horse. I so prefer Havva’s advertisement for these! I think it’s a cute litte toy set in and of itself, but it’s it seriously trying to outdo nature… yikes. And no, this doesn’t look anything like a real nature trail. This assumes facts not in evidence. Do we know that administrators have spines? There is already a large body of evidence that school administrators have little or no common sense. (But they do have hypertrophy of Political Correctness). Those are silly. My 4 year old daughter climbs on real logs and plays with real leaves and sticks. If there is no log to climb she climbs rocks and trees and anything else she can put her feet on. She is quite creative about what she can climb. She would be bored with those really fast. Ummm The last time I was in the woods (kids in tow I might add) I didn’t see a single log that was bright red, orange, or yellow with green stipes. Why do the manufacturers of products for young children insist on making everything in bright primary colors? If you are going to try and replicate the nature experince in safe nonskid plastic, you should at least try and stick with the correct color scheme. I think they’re kinda cute, and I agree with Donna. I’d be happy to see these in a big open room of a daycare/preschool, because it would be a good sign that they encouraged active play even if the weather is crappy. At least it’s a bit more interesting than the typical hollow plastic slide. I think I would definitely purchase this … if I were, say, on a colonizing mission on Mars and wanted some hokey earth substitute while I waited for the terraforming to kick in. What I do not understand is where is the plastic simulated crushed beer can, left behind by a hunter, and when you turn over the plastic log, is there plastic ants, slugs and other various plastic bugs? Just kidding. Preschool applications are great, may even encourage them to check out the real thing. The marketing to 3-7 age group is a bit ridiculous. Special needs kids aside, most kids is this age group would be more inclined to pick up the logs and use them as swords and such. Mind you the no slip undersides for safety is going to give kids a quick wake up call, when they jump on their first real log and it rocks side to side. LOL. Nothing really wrong here, as long as overprotective parents do not see this as a way to replace the real thing. And you know some will. Really, I’m mostly offended that these cost $249! Are they made of rubberized Brazilian Rosewood? The pieces look nothing at all like the trails where I run and hike. Well, this at least is a useful link for my undergraduates starting their Outdoor Learning module, and there are some thoughtful comments on both sides here, I know. But, really, could you make this up? “When the distance between all the rungs in a climbing net or a ladder is exactly the same, the child has no need to concentrate on where he puts his feet. Standardisation is dangerous because play becomes simplified and the child does not have to worry about his movements. This lesson cannot be carried over to all the knobbly and asymmetrical forms, with which one is confronted throughout life.” Danish landscape architect Helle Nebelong (quoted by me here). And to those saying ‘schools in urban areas don’t have trees and logs’ – I reckon you can buy a lot of real logs and leaves for $249, cash on delivery. But you’re right, nothing replaces “the real thing.” Unfortunately, in much of the US, going on an actual nature walk isn’t an option for much of the year. And kids need exercise every day. I guess it depends on how the toy is marketed. To me it just looks like an indoor toy. Laura, that’s what I think about tpys made to mimic adult ojects, mainly cell phones and keys. Make em look real, because that’s what kids want, even babies. And $249 is a crazy price for what you get. To me it looks like this boy is in a video game trying to advance to the next level. Okay, devil’s advocate here. I could actually see a class using this during “inside recess”. I don’t know if schools still have inside recess when it’s pouring rain or when, in my home state of Michigan, it’s way into the negative temperatures outside, but I could tell you my memories of inside recess were pretty chaotic. Imagine all the energy of an outside recess packed into a tiny, desk filled classroom. I think that maybe if kids had something that allowed them to play the same games they would be playing outside if the weather weren’t terrible, there might have been a lot less complaining about who got to be the black Voltron lion. Ha! I totally agree. Kids need to move and run and play to get their wiggles out- indoor or outdoor. Rainy days and freezing days require indoor play hours. But (most) indoor gymnasiums at schools could use their existing balance beams and bosus(or blocks) to make this obstacle course. Free. Honestly, I just picture your Voltron boys on this thing in school, picking up the “logs” and have a jousting match. Which could be fun…. Companies are in the business of making what earns the best profits, not business of making what’s best for the kids… they will try to market their goods way beyond the typical times/places/ages you would expect to use them. It only becomes a problem when users (parents, schools,etc.) swallow the manufacturer’s marketing messages hook, line and sinker without thinking whether they make sense or not. Yes kids need exercise every day, but study after study shows that inside recess just doesn’t cut it… and neither does a painted-green outside play area with all the “unsafe” trees, hard ground with grass on it etc. removed. Kids need to see REAL grass, trees etc. to get the full affect. And it isn’t as if, if a class buys this they will suddenly start letting the kids run around inside – because running inside isn’t safe. It will be the same, non-energy-burning inside recess, in that same small area, just now with expensive toys… which they will probably be required to line up and walk on. And then when that doesn’t satisfy their need to burn energy, they will probably be deemed to have ADHD. Yes the sun sets at 5 in the winter, but that is why it is even more important for kids to have recess in the winter. All humans need sunshine, and in the winter many kids are in school for ALL the hours of sunshine. Give each kid coats for cold days, raincoats for the rain, etc. and let them go outside anyway. If the weather is really too bad to go outside then it is too bad for them to be traveling to school. Schools where going outside, seeing real trees and etc. isn’t an option are a problem, and the solution is NOT plastic logs. THIS is from a company that markets to… daycare centers and schools, Lenore! Parents certainly can get the catalog, but it’s for school applications. I certainly saw it as a school use– In fact, your language suggests you did too. Who has a “reading rug” at home? As such, they have a lot of things for indoor play activities, like balance beam sets (pictured here). Sure, the other balance beams are cheaper (http://www.lakeshorelearning.com/seo/ca|productSubCat~~p|RA191~~f|/Assortments/Lakeshore/ShopByCategory/activeplay/balancecoordination.jsp) but they don’t have the configurability. While I believe in taking kids outside, I sympathize with the early grades schools and daycares where that isn’t always possible– taking kids out in the rain or snow, for instance, would probably require a round of complete clothes changes afterward, and since the rules allow you to have 1 teacher for every 8 three year olds, there goes the entire afternoon. My kid’s teacher even can’t take the time to change the kids in and out of boots on rainy days– the school’s 2.5 hour special needs preschool would be eaten up by shoes. I know you have to blog every day, but maybe get some more guest bloggers so you aren’t drumming up outrage over non-issues like this one. I’m waiting for Lenore to blast this Magnetic Fishing Set http://bit.ly/Um1uDn too, since if children want to fish the teachers should be taking them to fish with real lines in real water! @Amanda – Way to overstate an issue. Going outside is important. Humans have survived millenia without playing outside every single day. I live in Georgia (or did). We have intense storms and extreme summer heat. I would move preschools if the teachers were sending the kids out in thunder and lightning and tornado warnings. It is not safe to be outside but certainly not requiring of school being cancelled for the day. Summers are miserable 100+ degrees with 90% humity. The air is so thick that it is difficult to breathe. Asthmatics and others with breathing problems can really struggle. My stepfather has to use oxygen tanks every summer. And unless heavily shaded, playground equipment is too hot to touch between 11 am and 7. I completely understand preschools not taking kids outside in the heat of the day some days. Other places have deep snow and below zero winter temperatures. Neither worth cancelling school over but both difficult to manuever little bodies in. Nor has the species survived by braving all weather in some misguided needed for outside at all costs. In fact, we’ve survived by properly managing the weather. Storms have never been outside playtime. Even on the free range 50s, 60s and 70s. Summers in the south have always meant hunting up the nearest swimming hole but not much else. Winters in the north have always involved days where it was just better to stay home around the fire. So, yes, if you live in San Diego where it is 72 and sunny every single day, then there is no need for indoor recess. If you live in the rest of the very vast and varying US, there are probably going to be days where nobody wants to be outside. And why are you so sure that this toy can only be used to the exclusion of going outside? Is there no ability to go outside in the morning when the weather is cool and then play with this in the afternoon when it is 106 degrees outside? Or even to go outside 3 times a day and STILL use this in addition for something else fun to do? Without PLAYING outside – sure. But without GOING outside into the sun? No, that’s a very new thing. We survived for millenia without air conditioning, even in 100+ degrees with 90% humidity. If it’s too hot for kids to run around, they will naturally not run around, if the playground equipment is too hot to touch, they will naturally not touch it. But they can still go outside and get the benefit of the sunlight and seeing real trees and etc. A kid that has a major health problem that prevents them from going outside would of course be excused from going outside, but the truth of the matter is that going outside often HELPS asthma and other such problems. Of course kids should not be playing outside in storms, but as I said if the weather is too bad for them to be outside, it is too bad for them to be traveling to school because that requires going outside. Sure it’s POSSIBLE for a child to go outside 3 times a day and then come inside and play on this – but let’s be honest, at how many school is this done? At most schools in the US, recess has been/is being reduced or eliminated. Leave outside games to outside, where they can actually be done successfully,; there’s plenty of fun stuff to do inside, and if a kid has the necessary amount of outside time there is no reason to try to replicate the outside. Bahahahaha! That’s all I gots to say about that! my daughter goes to a forest preschool were they are outside all day every day, sun, rain, wind, snow. My kid’s first day was a cold day in January, -20C, and she had loads of fun! there is no way that you need balance beams masquerading as forest – why not just pieces of 2×4 sand them down and call it, balance logs? But we didn’t go outside in it!!! Most high heat climates had siestas in the middle of the day before industrialization started making it impossible. Where I live now, air conditioning is still a rarity except in businesses. Most traditional Samoan families stay inside napping and otherwise moving little from about12-5. They get up before dawn and start working the plantations, come in for lunch and stay inside until it starts to cool and then go back to doing chores until late at night. That is just a ridiculous notion. Forgetting for a moment that many storms do not actually start until my child is safely in school, schools do not need to be closed for every storm. Dashing in and out of the car is completely different from playing outside for hours. oppressing heat simply because well you just HAVE to be outside because … well you just have to be? No. Do I, who has happily hiked for hours in light rain, have any desire to hang outside in a cold torrential downpour simply because well you just HAVE to be outside because … well you just have to be? No. Do I, who enjoys snow shoeing, sledding and ice skating, have any desire to walk in hip deep snow for any length of time simply because well you just HAVE to be outside because … well you just have to be? No. So why exactly am I going to insist that children do it? If there is some goal in doing these things, then it is different. But this insistence that kids need to just be outside whatever the weather because they are kids and kids need to look at trees close up every single day, 365 days a year, just because they are kids is idiotic and goes against our basic human instincts of self preservation by staying out of seriously inclement weather. And I don’t know why schools buy these things. Or if any do. I do know that my kid’s daycare/preschool had outside time at least twice a day, only limited by perfectly reasonable weather restrictions. They even had trikes in a large covered area and a water park so outside play was done on days that would otherwise have been not fun. It was mandatory and most classes went out more often many days. That still left several hours of the day to fill. I could easily see anyone of my child’s preschool teachers pulling out something like this in the classroom on a normal day, even after the kids had been repeatedly outside. They had other similarly large toys like this that were used often – including slides, gymnastics mats, huge soft balls to roll on, tunnels to crawl through. This toy looks like something a little kid would enjoy so I’m not sure why everyone is so insistent that the fact that it is designed to look like trees (in a very abstract fashion) means that a bunch of people with college degrees in child development would suddenly decide that kids no longer need to go outside ever and that this is a reasonable substitute. it gets worse – I’m now seeing kindergartens and preschools that are getting rid of the standard wooden unit blocks – blocks that have been fixtures in ECE now for nearly 100 years – and replacing them with fake foam versions, complete with fake wood grain. I asked one teacher why: “because the wooden blocks are hard & heavy and someone could be hurt if they were hit by one.” In all my 22 years in ECE I have never seen a child injured by a unit block. Yes, it’s theoretically possible but it is so unlikely to ever happen. And the replacement foam blocks are soft and flexible so the sort of construction you can do with a real set of blocks is impossible. They are quite simply expensive useless junk. 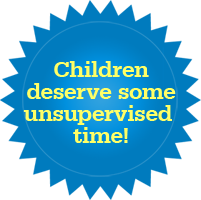 And guess what – the kids know it and they don’t play with them! So the important learning that kids get from the real blocks – learning about mass and measurement and construction and creativity and shared play simply does not happen. It’s enough to make you weep! How can people refer to outdoor play as ‘a belief’. Its likes saying I believe in healthy food. Its normal and shouldn’t even have to be analysed as much as it is here. I’m from the UK and here we have some fantastic forest schools, and reconnecting children to nature is becoming a widespread campaign in and out of schools. As a play worker and youth leader i make sure outdoor play is a normal part of the day! Our children can’t climb trees and leg it across fields because of restriction to areas in the playscheme, but we facilitate mud, sand and water play inside and out. Opportunities to play aren’t always about connecting to nature, but just about getting a balance of play types. @donna you rant about adults not wanting to stand in rain/snow/heat for no reason, but in a school if the children don’t mind being in the rain because its normal then just let them and send them to school in a good coat. Stop sounding so adult-agenda and think more about what the kids are happy to do. You aren’t forcing anyone maybe apart from yourself, but as a play worker I WILL freeze my asse off if the kids want to go outside. In regards to the plastic logs, they’re pointless. A waste of money, safe is boring for children and as Tim Gill talks about in his book, it doesn’t require concentration as its so far from the real thing. Nature is unpredictable and these are just bland, expensive and not needed in an indoor environment. With the fishing line I think @donna wrote, if its a board game that kids enjoy then its fine but to have logs that if meant to be used in an active indoor environment yet are going to be bought for US schools who aren’t even letting the kids be active inside and they’re too old for them anyway, the manufactures have shot themselves in the foot really. As someone mentioned, a urban school can buy real logs cheaper and put them in a sand pit. Why insist that children go outside, and deal with whatever mother nature throws at them? Short of disaster type weather, they need to be exposed to it. They need to learn that the cold won’t kill them, that the heat won’t kill them. And yes I know all about heat related deaths, and cold related deaths. They are either accidents, or elderly or ill prepared individuals. I have seen the direct results of a generation of outdoors only during good weather, they are wimps. I have actually had employees under my supervision tell me that they do not have to work outside in the rain, snow, cold or heat. That it is abusive to make them do so. I wonder which they consider more abusive, working in the elements or standing in the unemployment line? Which is where they go after refusing to work, in the elements. For all you that feel we need to shelter our precious little dolls made of sugar, good luck. Wait untill you are snowed in, have a flat, or had a heart attack, and the people suppose to plow, tow or save your life won’t go out in the rain, cold, heat, or snowstorm to help. I work outside more than inside, no matter what the conditions. At forty below celcius, in driving winds on the side of the highway, at 2 in the morning, changing a tire on a county fire truck. On black ashphalt at 40 plus celcius, at 90% humidity, in the middle of the day, replacing all 8 drive tires on a truck, and the 2 steers. Why? Because it is my job. I take all precautions to protect myself from the enviroment, and I get the job done. The kids today would not do this, and my line of work isn’t the only one that requires this type of stamina or attitude. Becareful of the generations we are raising, because it will come back to haunt us. Why does the kid in the picture have to be shod even on these artificial, indoor logs? Generally I do not learn article on blogs, but I would like to say that this write-up very compelled me to try and do it! Your writing style has been surprised me. Thanks, quite nice article.